Social media can be a useful tool for businesses, bringing advantages such as engaging with your audience and boosting website traffic. However there can also be disadvantages, including the resources required and negative feedback. Considering these pros and cons can help you decide the best approach to social media for your business. Brand awareness - Compelling and relevant content will grab the attention of potential customers and increase brand visibility. See branding: the basics. Brand reputation - You can respond instantly to industry developments and be seen as ‘thought leader’ or expert in your field. This can improve how your business is seen by your audience. See public relations (PR). Cost effective - It can be much cheaper than traditional advertising and promotional activities. The costs of maintaining a social media presence are minimal. If you choose to invest in paid advertising, you can spend as much or as little as your budget allows. Website traffic - Social content can boost traffic to your website. This can lead to increased online conversions such as sales and leads. Evaluation - It is easy to measure how much website traffic you receive from social media. You can set up tracking to determine how many sales are generated by paid social advertising. Customer interaction - You can deliver improved customer service and respond effectively to feedback. 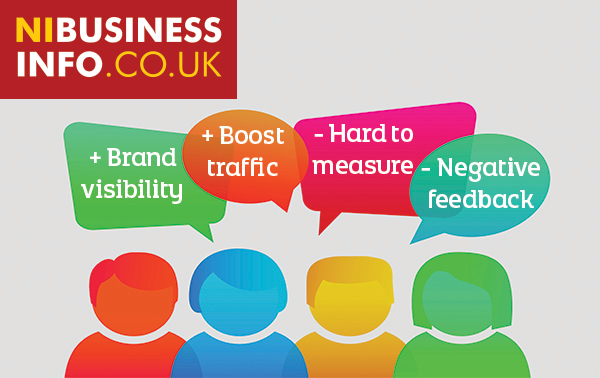 Positive feedback is public and can be persuasive to other potential customers. Negative feedback highlights areas where you can improve. Target audience - Customers can find you through the social media platforms they use most. You can choose to maintain a presence on particular platforms that are in line with your target audience. For example, if you are targeting young people you could reach them through Snapchat. If you are seeking business customers, LinkedIn may be the best channel. See social media platforms. Brand loyalty - You can build relationships with your customers through social media. This can help increase loyalty and advocacy. Resources - You will need to commit resources to managing your social media presence, responding to feedback and producing new content. This can include hiring and training staff, investing in paid advertising and paying for the costs of creating video or image content. Evaluation - While it is easy to quantify the return-on-investment in terms of online sales generated by social media advertising – there are some less tangible benefits. It can be hard to measure and place a monetary value on the brand awareness and reputation that social media can bring. It’s difficult to know how social media effects sales in-store. Ineffective use - Social media can be used ineffectively. For example, using social media to push for sales without engaging with customers, or failing to respond to negative feedback - may damage your reputation.